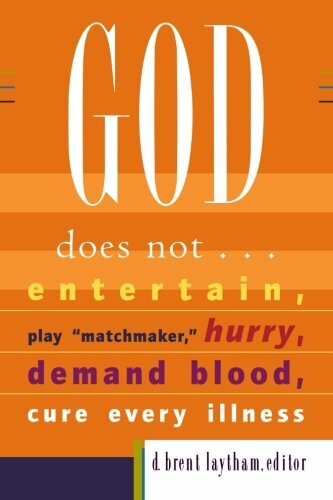 Is God in the business of entertainment, matchmaking, time management, blood sacrifice, or medicine? If you listen to some messages both inside and outside the church today, you might think so. But in God Does Not . . ., several theologians challenge these and other widespread misconceptions of how God works in the world.A followup to the popular God Is Not . . ., this book is both accessible and provocative. In the end, we are left not with a negation of what God does, but an affirmation of a God who does all things well and often far exceeds what our human imaginations can fathom. God Does Not . . . challenges several widespread misconceptions of how God works in the world. Joel Shuman reveals that although God does not wear a white coat and always cure, he always heals. Daniel Bell argues that the logic of blood sacrifice permeates today's culture and challenges the notion of redemptive violence. Kelly Johnson shows that the frenetic pace of daily life does not mesh with God's patient peace. Does God write the perfect love story for each of us? Margaret Kim Peterson andDwight Peterson help us see how our idea of God's plan for love and marriage is distorted by our desire for Hollywood happy endings. Jason Byassee cautions against revering contemporary cinema too highly and concludes that God's church is where the action is. And finally, D. Brent Laytham paints a picture of God's work in the world through the lens of the Father, Son, and Holy Spirit. A follow-up to the popular God Is Not . . ., this book is highly readable and provocative. In the end, we are left not with a negation of what God does, but an affirmation of a God who does all things well. D. Brent Laytham (Ph.D., Duke University Divinity School) is dean of the Ecumenical Institute of Theology at St. Mary'sSeminary & University in Baltimore, Maryland. He previously taught at North Park Theological Seminary. He is an ordained minister in the United Methodist Church and takes special interest in bringing pastors and scholars together to address theological and ecclesiological issues.